An FIR was registered on Monday against senior Samajwadi Party leader Azam Khan for his "underwear" jibe against Bharatiya Janata Party leader and film actor Jaya Prada who is fighting the Lok Sabha polls from Rampur against him. 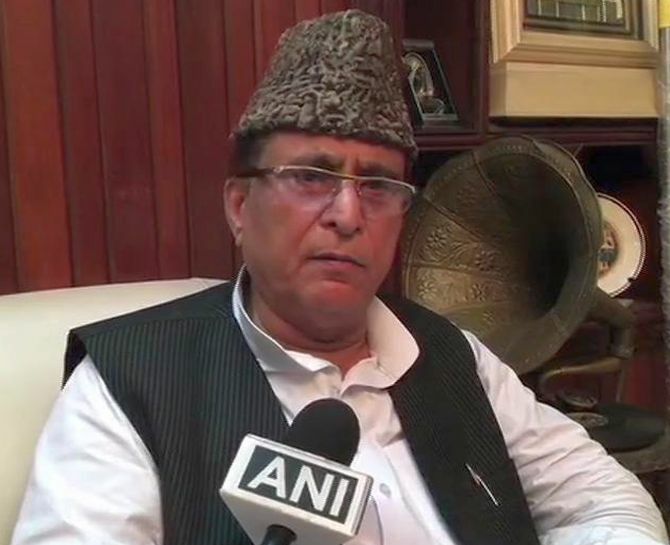 District magistrate of Rampur Aajaneya Kumar Singh on Monday said, "An FIR has been registered against Azam Khan under section 509 of the IPC (word, gesture or act intended to insult the modesty of a woman) and under sections of the Representation of People's Act." On Sunday, without naming the actor, Khan told the gathering in an election rally in Rampur "... you got represented (by her) for 10 years. "Rampur waalo, Uttar Pradesh waalo, Hindustan waalo, usski asliyat samajhne mein aapko 17 baras lag gaye. Main 17 dinon mein pehchaan gaya ki inke neeche kaa jo underwear hai, woh khaki rang kaa hai (People of Rampur, people of Uttar Pradesh and people of India, it took you 17 years to understand her reality. But, I could recognize it in 17 days that she wears a khaki underwear. )," said Khan. 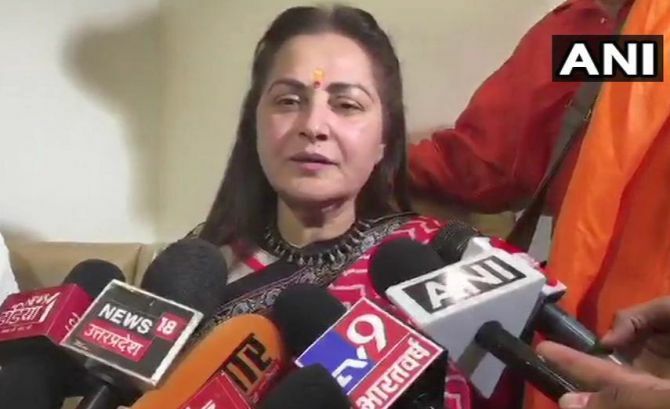 Actor-turned-politician and Rampur Bharatiya Janata Party candidate Jaya Prada sAzam Khan should not be allowed to contest the ensuing elections, adding that his "vulgar remarks" will not deter her from contesting polls from Rampur. The actor-turned-politician's remark comes a day after Khan while addressing a rally, claimed that the former wears "khaki underwear." "If he (Khan) thinks I will leave Rampur due to his fear, his comments cannot deter me. And I will not leave Rampur," Jaya said. "He shouldn't be allowed to contest elections. Because if this man wins, what will happen to democracy? There will be no place for women in society." The BJP leader also said she will defeat Khan in the parliamentary elections, adding that this is not the first time he is making such remarks. "Do you not have a mother, daughter or wife at home? Do you behave with them like this? Azam Khan sahab, you listen. I will fight and win the polls. I will tell you who is Jaya Prada after winning the elections," said a visibly angry Jaya. Questioning SP chief Akhilesh Yadav's silence on Khan's remark, she said, "I consider Akhilesh as my younger brother. But what did he do when Azam was using these type of words against me?" However, Azam on Monday clarified that he had not named anyone in his speech. "I have not taken the name of any person, nor did I tell the positive aspect or negative aspect of anyone. I only referred to a sick person in Delhi, who deserves sympathy, and who had once said that he will spray bullets on me with 150 rifles...I only said that it took people long to identify them, and the same mistake was committed by our party leaders as well," the SP leader said. "It was also known that there was a RSS pant on his body, and pants are worn by men. If anyone can prove that I had taken any name, or maligned anyone, then I will not contest the polls," Khan added. "I am disappointed. Media does not like me; I also do not like them. They have caused damage to the country," he said. The actor-turned-politician Jaya Prada had won the Rampur Lok Sabha seat in 2004 and 2009 on SP ticket, but later she was expelled on account of alleged anti-party activities in 2010. She had joined the BJP last month. The National Commission for Women on Monday strongly condemned the “extremely derogatory” remarks made by Samajwadi Party leader Azam Khan against actor-turned politician Jaya Prada and issued a show cause notice to him. Can 'PM Kisan' help BJP in UP?